Developer Quote: "NewsCenter Global is an efficient news reader for the iOS device." 3. Tags view shows you the people, places, and topics that the news discuss, so you can quickly jump to a topic that interests you. Open the app and pick your fave countries by tapping the gear wheel Settings icon on lower right of display. From there you can also Login to Facebook to share your articles or Change Font Size for easier viewing. 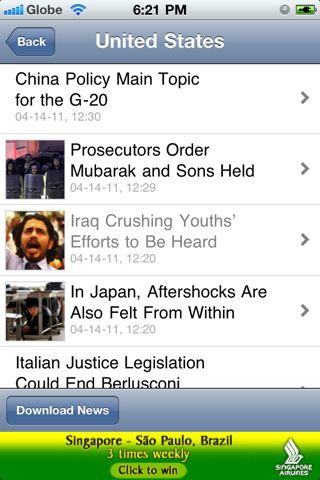 Once you've selected your countries and local papers, tap Download News to get the latest information. If you tap the image icon, you will see the article defined by it's cover shot. After reading your feature, share it on Facebook, send by E-Mail (from within the app) or save it if you like it! You will then find this same article saved under the file drawers icon. Find out what's happening in the world with a few taps, all in one easy-to-read app with many customizable features. COOL CONCLUSION: "NewsCenter Global brings you fresh off the press worldwide news so that you can satisfy your international news craving!"